This is a GREAT product…!!!! I can’t understand why it has been discontinued. Why, why, why..? yea WHY is it discontinued I LOVE IT!!!!!!! WHY WHY WHY???????????????? I have googled a trail mix exactly once in my life. Why? Because I had tasted heaven when I sampled TJ’s More Than a Mouthful Trek Mix. I immediately bought a bag, but when I returned to the store weeks later it was nowhere to be found. Months later I still remember that Trek Mix fondly, so I just had to google it and was dismayed when I read on this site that my new friend had been discontinued. I can’t fathom why this legend of deliciousness would be discontinued. Please bring it back. Seriously, the best trail mix EVER from Trader Joe’s and now it’s discontinued? Why do you do this TJ? Anytime I REALLY like a product, you always discontinue it! Bring it back, please!!! 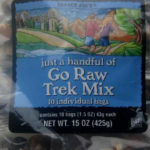 Of all of Trader Joe’s trail mixes (or anyone else’s for that matter) More Than A Mouthful Trek Mix was by far my favorite. Mixed with Trader Joe’s blister peanuts, it made the best mix on planet earth. Discontinuing it was a bad move. Hopefully Trader Joe’s will see the light and bring it back. 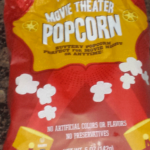 This was the only trail mix I’ve ever tried that I actually liked. So sad. Please bring it back! Excellent mix, perfect balance of sweet and salty and I ntriguing mix of textures- hard, soft, snappy, melty. Santa put this in our stockings this last year. Went to restock and found that it had been discontinued. Why T.J., why??? Are you bringing it back seasonally? Did your supplier run out of those inexplicably sweet and salty yogurt puff treasures? We feel so sad. And so does Santa. I love TJs and I appreciate their products, but one thing that happens more often than I would want and that I do NOT appreciate at all is the fact that they come up with products that are addicting and delicious, and perfect. Then…. Out of nowhere, they stop supplying. 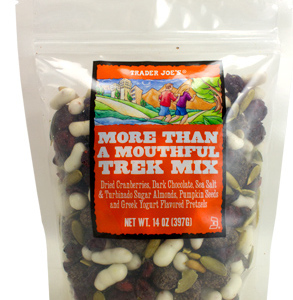 I tried “More than a mouthful” first when it went on sale for $2.99 I could not believe my eyes. Such a treat, so tasty!. Seriously, the best mix out of all the store’s selection. At that price and so good, this was the only one of your bags I would buy. All of the other recipes are good too, but the chocolate covered almonds and yogurt bites are outrageous. Not only no other mixes in the store have this, but the $2.99 price per bag was SO RIGHT! i would buy 3 or 4 bags at a time to share with family. But suddenly I came to find out that THEY ARE GOOOOONE!!!!! I’ve gone to every store I know in my area and other areas as well and NO store has it. It’s not fair. I miss the More Than a Mouthful Trek Mix. I will not be buying any other“trail mixes” from TJ’s now. They have gotten rid of, possibly the best seller and this fact,doesn’t always increase sales of other options they have in store. Please please please bring this mix back!!! 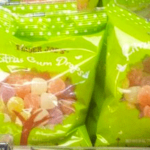 I was so shocked to hear that it was being discontinued, and bought about 6 bags before our store ran out. I LOVE THIS MIX … PLEASE BRING IT BACK TO JOE’S! This is the best trek mix Joe’s has had. Each bit is a surprise and filled with such a great variety of yummy goodness. PLEASE BRING IT BACK! I’m adding to the chorus of bring back More than a Mouthful Trek Mix. I thought perhaps I didn’t see it on the shelves because it was just seasonal, and was disappointed to find it was discontinued. You must have had a concussion or something, because why else would you take this off your shelves? Wish I could rate it as 1000000 stars out of 10. 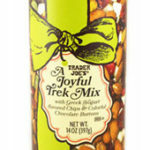 I love this trek mix so much and it brings so many tears to my eyes to fact that it has been discontinued. WHY?? I wanted to raise my first-born child off of this amazing treat, it is truly a lifestyle. If I had to live off of only two types of foods, it would be this, and this. This heavenly combo of angel nuggets and Jesus hugs brings so much happiness into my life. Without it, I have no purpose. 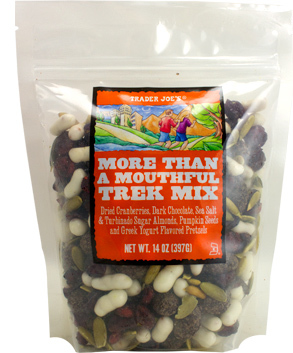 Trader Joe’s, please, for all of us, bring back the More Than A Mouthful Trek Mix. I loved this mix! Perfect combo of sweet and salty, love the pop of the yogurt pieces. Please bring this back! More Than A Mouthful Trek Mix is the absolute best. Please bring it back. You discontinued the Habanero Pistachios (after I became addicted) and now this. BTW – the Chili Lime Pistachios just don’t cut it! I cannot be the only one who enjoyed the zip of the Habanero. And my all time favorite Trek Mix. Please bring it back. In addition, cranberries are eaten all year long – can we have the Cranberry Bars all year long as well???!!! Am seriously sad this is not being sold anymore. I pretty much ask every time I go into trader joes if they have it just to see if it’s been brought back. This is the best, most amazing trail mix I have ever had and am very disappointed it’s no longer available!! !